Book Air France flights & plane tickets on NusaTrip.com. Search any flight routes, compare prices with other airlines : Simple & Fast, 24/7 instant booking. Find all Air France flights on all routes, get the cheapest fares in France, Europe when booking your Air France plane tickets, cheap, on NusaTrip.com. Air France is the French flag carrier, headquartered in Tremblay en-France (north of Paris). As a full service global airline, Air France serves 36 destinations in France and operates worldwide scheduled passenger to 168 destinations in 93 countries across 6 major continents. This airline is a subsidiary of the Air France-KLM Group and a founding member of the SkyTeam global airline alliance. Economy Class: Passengers will experience a comfortable and adjustable seat with 32 inch of seat pitch, recline up to 118 degrees, more space for legs and knees, fully retractable armrest, an adjustable headrest and footrest. For passengers on long haul flights are able to enjoy their entertainment on a personal video screen with Audio/Video on Demand with a recyclable headphone, feather pillows, blankets and small amenity kits. Air France also offers a mask and a refreshing towel at no extra charge and earplug is available upon request. Full meal service with range of beverages including alcohol also offered on long haul flights and second meal service and snacks available between meals. On the Boeing 777-300ER, Air France also provides a personal telephone for their passengers. For international flight passengers, baggage allowance is up to 23 kg and 2 x 23 kg bags on some destinations. 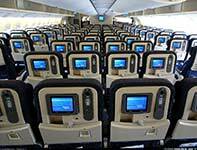 While for Economy Class passengers on short haul flight (within Europe) can entertain themselves with TV shows or movies on drop down screen and enjoy three course meals and snack on medium haul flights with wide choice of drinks start from hot and cold, alcohol and non-alcoholic beverages. Baggage allowance for passengers on this flight is up to 23 kg. Premium Economy Class: Air France Premium Economy Class is located behind the Business Class cabin and in front of the Economy Class cabin, separated from each by a divider. This class is available for long haul flights on the Boeing 777-200ER, 777-300ER, Airbus A330-200 and Airbus A340-300 in late 2009 and early 2010 and also on the A380-800 in late 2010 and early 2011. The cabin contains a limited number of seats distributed over 3 rows. It offers personal space with 20% more leg room and 20% wider seats than Economy. Passengers also are able to discover leather armrest, an adjustable head, leg rest, an adjustable footrest and storage spaces for personal item in their seats. To ensure passengers for work or entertainment, the seat also includes a noise-reducing headseat, an interactive video screen measuring 10.4 inch with Audio/Video on Demand, a personal adjustable reading lamp, a wide seat-back tray table for laptop, and an electronic PC outlet to charge laptop. Premium Economy Class passengers will get benefits including a feather pillow, a bottle of water, blanket and amenity kits. Baggage allowance for this class is up to 2 x 23kg bags. 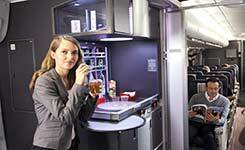 Passengers also will discover meal service same as Economy with choice of two hot meals plus aperitifs, champagne, liqueurs and wines; mini sandwiches and Haagen Dazs ice cream offered (except on Caribbean and Indian Ocean networks) and also welcome drink. 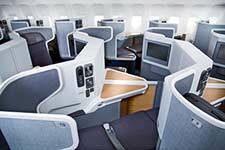 Business Class: Air France Business Class is available on all long haul aircraft. The cabin provides the space to stretch legs and rest. In the middle seat is replaced by a tray table for work. Passengers can transform their seat into a spacious bed up to 2 m (6.5 feet) in length. Passengers can easily find the best position by using seat controls. The Business cabin seat is also equipped with a flexible armrest to improve access for passengers with reduced mobility, a power outlet to plug in laptop or other electronic devices, noise-cancelling headphones, a personal reading lamp, a personal telephone to make calls via satellite and a storage space for documents or laptop. Passengers are able to enjoy entertainment onboard via a personal screen features with Audio/Video on Demand. On long haul flights, feather pillow, blanket and amenity kits are also provided. Passengers on long haul flights will discover restaurant multi course meals with wines and liqueurs and for passengers on short haul flights will enjoy meal service with cocktails and also welcome drink. Baggage allowance for this class is up to 2 x 32kg bags. 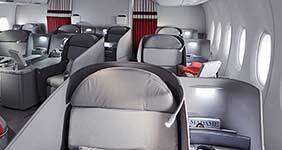 La Première: La Première is long haul first class Air France, available on the Airbus A380-800 along with select Boeing 777-300ER and 777-200ER aircraft. Passengers will discover the La Première cabin, composed of 4 to 9 gently curved seats in elegant and subdued hues, combining style and privacy. Air France offers seat with direct access to the aisle. Passengers can transform their seat into a full bed up to 2 m (6.5 ft) in length including a mattress, hypoallergenic feather pillow and a duvet. Passengers also can use the spacious drawer in front of their seat to keep all their stuff. Air France also provides a wide tray table for working or enjoying a meal. A personalized coat service and a full range of accessories such as slippers, lounge wear, a dust bag for shoes and a travel kit with body care product are also available. Passengers also are able to enjoy 10.4 inch interactive video screen to access a varied lineup of on demand video. In addition, the seat is also equipped with a power outlet, a reading lamp and auto-massage function. Baggage allowance for this class is up to 3 x 32kg bags. Restaurant quality meals also served on demand throughout flight. Intercontinental/Carribean/Indian Ocean Flights: Economy Class passengers can carry onboard a free baggage allowance 12 kg and 18 kg for Premium Economy Class, Business Class and La Première with maximum dimensions 55cm x 35 cm x 25 cm. Flights within Europe/Northern Africa/Israel: Economy Class and Premium Economy Class can carry onboard a free baggage allowance 12 kg and 18 kg for Business Class and La Première with maximum dimensions 55cm x 35 cm x 25 cm. Passengers who traveling with infant on their lap, can carry 1 additional small baggage item in the cabin at no extra charge. The baggage item must weigh less than 12 kg (26.4 lb) and maximum dimensions less than 55 x 25 x 35 (21 in x 13 in x 9 in). A small foldable stroller (maximum size: 15 cm x 30 cm x 100 cm / 5.9 in x 11.8 in x 39.4 in) may also be accepted in the cabin. All other foldable strollers (maximum size: 55 cm x 35 cm x 25 cm / 21 in x 13 in x 9 in) may be accepted on board as a replacement for the hand baggage allowance for infants. The maximum baggage limit for Economy Class is one piece with maximum weight up to 23 kg and 2 x 23 kg bags on some destinations, 2 x 23 kg bags for Premium Economy Class, 2 x 32kg bags for Business Class and 3 x 32kg bags for La Première. Sports equipment cannot exceed a weight of 23 kg / 50 lb (or 32 kg / 70 lb if you are traveling in the Business or La Première cabins). 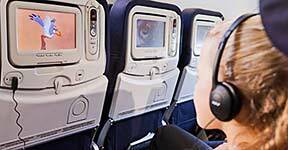 Air France passengers are able to enjoy Audio Video on Demand (AVOD) in all cabins on all long haul aircraft. Passengers can choose multiple channels of video, music, audio and games. On all flights, all movies may be watched in English, French, Spanish, Chinese, Hindi, Korean and Japanese. Passengers are also able to learn languages with Berlitz International language courses on the in-flight entertainment system. Air France also offers Air France Magazine as the airline’s in-flight publication at each seat. Passengers also can stay online on their smartphones, laptops or tablets with in-flight Wi-Fi on Boeing 777-300ER. Economy Class: A wide selection of beverages (hot or cold, with or without alcohol) and a snack suited to the flight´s duration and departure time will be served at no extra charge. For flights within metropolitan France, passengers will enjoy hot beverages and pastries in the morning, refreshments and sweet or savory snacks at all other times of day. For flights within Europe, depending on your flight's duration, passengers will enjoy hot beverages and pastries or breakfast in the morning and refreshments and sweet or savory snacks, sandwiches or a cold platter at all other times of day. 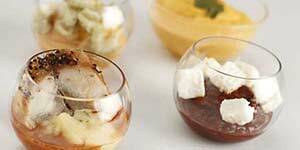 Premium Economy Class: Air France offer fine meals on flights of any duration. Breakfast, lunch, dinner or snacks are served depending on the flight time. During meal service, passenger will enjoy a complete, tasty meal, including an appetizer, main course and dessert. For flights of 2.5 hours or more, the main course is always served hot. On flights of less than 3 hours, you will be welcomed on board with a refreshing Japanese hand towel (oshibori). Business Class: On all flights, Air France serves prepared meals adapted to passengers travel time. For breakfast, we provide a selection of warm pastries. At lunch and dinnertime, passengers receive a complete, delicious meal including an appetizer, main course and dessert. And for all flights over 3 hours, Air France offer a welcome beverage, digestive liqueurs and coffee with a pastry. In addition, cocktails (with or without alcohol) are available by request on all of our flights. La Première: Passengers will discover the gourmet menu developed by Michelin-starred French chefs, including culinary designers like Joël Robuchon, Régis Marcon, Guy Martin and Michel Roth with wine country on wine list, updated every 2 months. Domestic Flights and International Flights: The Check-In Deadline varies from 15 to 90 minutes before departure time, depending on your departure and arrival airport. Web Check-in available beginning 30 hours before the flight departure time and 24 hours before flight departing to the following cities in the United States: Atlanta, Cincinnati, Detroit, Minneapolis, New York-Newark, Philadelphia and Pittsburgh. Children under the age of two do not need a reservation, they can travel on your lap at no extra charge on flights within metropolitan France, or at a reduced fare on international flights. When passengers travels with child travels, passengers receive a reduction on their fare of up to 15% on short-haul flights and 33% on medium and long-haul flights. For all tickets, please be advised that a cancellation charge may apply depending on the rules applicable to the fare type purchased. Passengers should have been made aware of these rules while purchasing your ticket. A refund request can be made online but online refunds are not available for Flying Blue award tickets. The name indicated on passenger ticket cannot be modified. If passengers have already purchased their ticket, the conditions for cancelling a reservation depend on the fare your purchased.